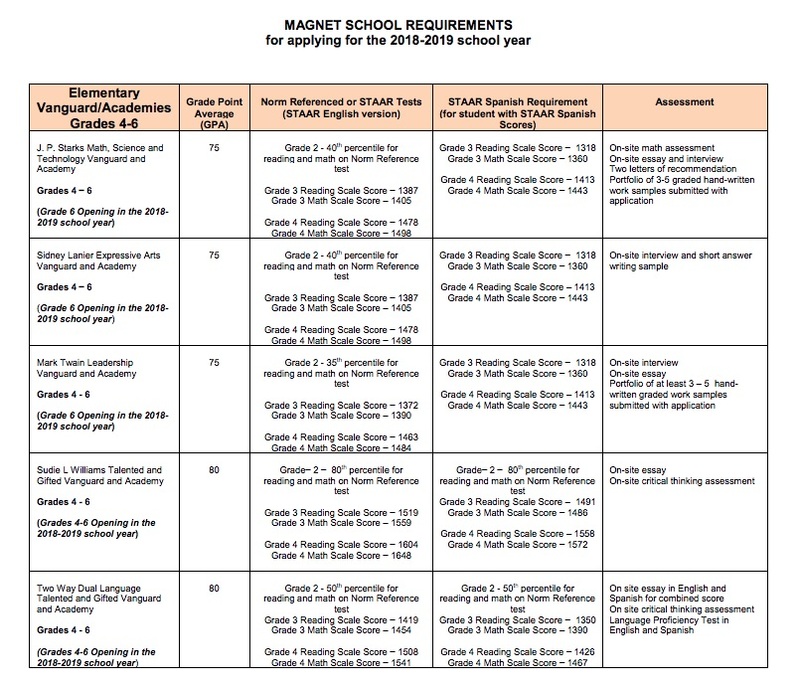 Five Dallas ISD magnet schools have extended their application deadlines through Feb. 28. These include the new Two-Way Dual Language Talented and Gifted Academy and Sudie L. Williams Talented and Gifted, both set to open in August 2018. Additionally, J.P. Starks, Mark Twain and Sidney Lanier are expanding their magnet programs to grades 4-8. All five schools are accepting applications for incoming fourth- through sixth-graders. This is a great opportunity for students currently in grades 3–5 to attend a phenomenal school in Dallas ISD. What are the magnet schools still accepting applications? Go here to fill out the application for any of these five magnet schools. Select the grade you are applying for. Select your first choice program. Also, optionally you can select your second choice program at the same time. Print, sign, and take your application to your first-choice program by with the required supporting documentation. Any existing IEP and/or 504 plan/accommodation plan, if applicable. If the situation is temporary, once you have moved into your own home, you will need to bring proof of residency for your new home. Dallas ISD is hosting special application workshops on Wednesday, Feb. 21, for J.P. Starks Math, Science and Technology Vanguard; Sidney Lanier Expressive Arts Vanguard; and Mark Twain Leadership Vanguard. The application workshops will be held at each campus from 6–8 p.m. Meanwhile, the Two-Way Dual Language Talented and Gifted Vanguard and Academy and Sudie Williams Talented and Gifted Vanguard and Academy are hosting information sessions and application workshops from 6–8 p.m. on both Feb. 20 and Feb. 22. Sudie Williams is hosting the sessions at the campus located at 4518 Pomona Road. Since the Two-Way Dual Language Talented and Gifted Academy is under renovations, Annie Webb Blanton Elementary School, 8915 Greenmound Ave., is graciously hosting information sessions for the school.